REPOST: Why do we make students sit still in class? According to this CNN.com article, an educator and mother wonders why many insist classrooms be still and quiet. (CNN) — As a graduate student, I had the opportunity to observe a number of idyllic, progressive classrooms where students danced to the pencil sharpener or sprawled across beanbag chairs while completing their work. I read countless books and articles about research that supports physical activity as part of academic success. It made sense to me — theoretically — that children should be allowed to move their bodies. Asking them to do otherwise, I came to believe, could be detrimental to both the student and the teacher. Then it got personal. I had two children of my own, two fearless boys who are so busy they don’t have time to stop for uninteresting activities like eating, sleeping or potty training. Our eldest son lobbed himself out of his crib at 10 months and hasn’t stopped climbing since. Putting clothes on our younger son currently involves a high-speed chase followed by a wrestling match and, if we’re lucky, ends with at least one piece of clothing partially in place. Obviously, it takes more than a little mental and physical effort for them to keep their bottoms in a chair. This doesn’t bode well for academic success in traditional classrooms, where sitting quietly is a prerequisite for nearly all instruction. I cringe in anticipation of the notes my sons’ constant motion and chatter will prompt future teachers to send home. I worry that their intellectual prosperity will be curtailed by the simple, but daunting, expectation that they sit still for hours each day. In my household and others, the question looms: Does sitting in any way help students learn? Why do we feel the need to tame students’ physical natures, rather than incorporate them into the learning process? By sending our children off to still, quiet classrooms, are we neglecting meaningful, hands-on learning that could be occurring through physical activity? After all, the brain is ultimately an essential part of the body, a co-conspirator with those wiggly feet and chatty mouths that get little ones into trouble. As the late arts educator Elliot Eisner reminded us, we learn about the world through our senses, drawing information in through our bodies to feed our understanding of the world. That the mind is nestled within our physicality is not a new concept, but perhaps a nearly forgotten one in our age of cerebral and cyber wealth. Even in the early 20th century, progressive educator John Dewey famously unbolted the desks from the floors of the classroom, arguing that education stems from experience. More recently, we’ve seen treadmill desks and bouncy balls substitute for desk chairs. As an educator with an interest in authentic learning, I wonder if that is enough. As the mother of super-physical children, I worry that it’s not even close to being enough. The paradigm of the still, quiet classroom with neatly aligned desks unfortunately requires that some students spend a great deal of energy complying with physical restrictions rather than learning. Certainly, at some point, children need to learn to control their bodies. But making it an overriding concern in the classroom might be a waste. Meanwhile, commitment to recess, art, labs and nearly any type of learning that involves the body is generally dwindling. As an educator and mother, I know that image is fundamentally at odds with the nature of children. So, educators can either spend a great deal of energy trying to get students to conform to the expectations of quiet focus — or they can change the expectations. On my quest to find educational arcadia for my children, I explored the options available in our neighborhood. Just looking around at the schools near my home in Atlanta — private, charter and public schools that my children could attend — I found innovative teachers and administrators who don’t want students to sit still and work quietly. They’re making changes to schools’ physically restrictive natures, sometimes for entire buildings, and sometimes just at the classroom level. It wasn’t always obvious, and required me to ask questions and look closely at how classrooms were set up. Here were three educators I found who were finding ways to make movement a part of how their students learn. Just as my concerns about my sons’ educational futures began to crescendo, we struck gold. A progressive private school opened mere steps from our front door. Focused on experiential education, a sense of community and child-focused flexibility, Hess Academy has my oldest, wiggliest son flourishing. According to Kristen Hess, the principal and founder of Hess Academy, movement in the classroom is an extension of student choice. The best learning environment, she said, has different options, not just a standard solution for all students. I could see her philosophy at work in a classroom where students worked, some sitting at tables, some stretched across the floor and some using their chairs as writing surfaces. Hess sees at least three roles for movement in the classroom: It’s a way to optimize focus and attention, to release pent-up energy so students can focus on a different activity, and as a vehicle for learning. Taking advantage of just one of these aspects, she explained, is usually insufficient. “Unfortunately there is a trend of decreasing movement in our daily lives and spending less time outside,” Hess said. “We have to counter that in the classroom by giving students time to interact in meaningful ways. All of our teachers believe that movement enhances learning. The school itself has the feel of a beehive. During a recent visit, once class was moving around the school on a scavenger hunt. In another class, students scattered around the room to discuss ideas and create drawings for “Think Out of the Box Thursday,” where they transformed a given shape into creative creatures and inventions. The littlest ones conducted an experiment, setting an insect buffet outside their classroom window to see which foods ants would eat. The activity often extends outdoors. 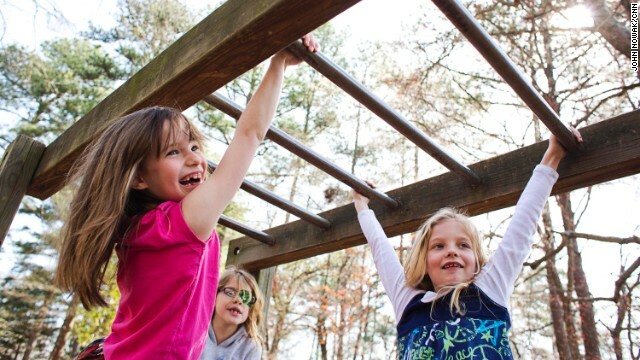 The days typically started and ended on the playground, where all students got a physical outlet to burn off their extra energy before even entering the school. It’s an extension of the classroom, a place that marries play and learning. Recently, when I arrived to pick up my son, I found him scouring the playground to locate and identify insects or collect food for caterpillars and grasshoppers. It wasn’t just my child’s curiosity at work; it was part of a classroom unit on bugs. The learning comes home, too: His classroom’s tadpoles inspired him to give us nightly tadpole updates and regularly re-enact the birth of a tadpole from its egg by curling up under a blanket and popping out. Many parents might assume that such freedom of movement means classroom chaos. They might believe their child would never succeed in such a setting, and they might be right: Not all children are suited to this kind of environment and not every teacher is comfortable or capable of managing it. Truthfully, I would be skeptical had I not witnessed enough classroom settings to see that this approach works — but only if it is coupled with a clear structure. This is particularly important during transitions. Teachers who embrace this flexibility need the finesse to effectively shift students from less restrictive activity to more organized work. Knowing the students, their limits and strengths is key to understanding what techniques might work best. Redirecting their entire bodies — not just their brains — effectively moved students in the next direction. With a different class, she might clap a rhythm that students would repeat. With her current group, she laughed, that would set off a clapping frenzy. She’ll save the applause technique for another year. Not all parents have the resources or the desire to send their children to private school. It didn’t seem like an obvious option for my family, and I’m still surprised that we were able to make it happen. Fortunately, there are options. Although the freedom of movement might not be an explicit part of every school’s curriculum, teachers in all kinds of schools are trying to incorporate movement into their classrooms. At the International Community School, a public charter school near my home that offers an International Baccalaureate, I found fourth-grade teacher Drew Whitelegg. He makes a point of allowing a lot of movement among his students. His curriculum is inspired in part by Jonathan Kozol’s book “Letters to a Young Teacher,” which explains that kids are good at moving and talking a lot — and yet, institutions are surprised when students struggle to sit still and stay quiet. In the classroom, students moved constantly — at their own discretion and at the request of the teacher. I saw one student sit in a swivel chair with wheels so she could oscillate rhythmically during the lesson. A soccer ball lingered under the feet of one student, and then another. During a math lesson on place value, a group of students lined up in front of the class holding numbers ranging from .001 to 100. Using the soccer ball as a decimal point, Whitelegg asked the class to put the numbers in order. He demonstrated the lack of symmetry on either side of the decimal point by moving the students so their line folded in half. While movement wasn’t part of the entire school’s mission, Whitelegg explained that teachers try to match rising students’ needs with teachers’ strengths. His classroom often winds up with students who need to move. His classroom can look chaotic compared to others, he said. Recognizing that his colleagues tend to use teaching models that support a quiet classroom, he said that he is more comfortable in a more dynamic environment — and so are the children that end up in his classroom. He emphasizes the need for students to learn boundaries early in the school year and to build a classroom culture in which students know what to expect. Finally, I visited our local public school, where you might expect it to be most difficult for teachers to rethink traditional classroom expectations. Unlike private schools that have the liberty to approach education in unconventional ways, public school teachers are beholden to an entirely different set of expectations and standards. Although teachers at the school attested to administrative support for unconventional strategies, it seemed conditional on rising test scores. It is easy to understand why teachers under such scrutiny might avoid taking risks, but some teachers are up to the challenge. I met Carlita Scarboro, a first grade teacher, at Laurel Ridge Elementary, near Atlanta. Scarboro’s classroom is active and lively, full of confident and convivial students. Scarboro’s interest in allowing movement in the classroom originated with her experiences with her own son, who was diagnosed with a mild form of autism. Her experiences volunteering at her son’s school and her background in business and event planning informed her “rogue” teaching philosophy: Her classroom, she believes, is a lab. “I like to take them out for field work,” she said. Getting students involved in activities allows them to better grasp the content they’re studying, she said. In her class, students watched a video on goods and services, then followed it with an activity: Pairs of students wrote scripts and used props to act out the parts of consumer and producer and to portray the laws of supply and demand. I saw how their bodies became part of the learning, with students celebrating vocally and physically when they answered correctly on the group quiz that followed. Scarboro moved herself, her students and their work around the classroom to keep them on their toes. Students moved from the rug to their tables and to various part of the room to submit papers or deliver the lunch count to the cafeteria. Allowing movement in the classroom requires a lot of classroom management, Scarboro told me, and despite the motion and noise, it was highly structured. There were clear signals to transition from one activity to another, to quiet down or shift students’ attention. She built in some organization in fun, easy-to-understand ways, too. At the beginning of the year, students were organized into teams and their spots on the carpet were color coded to coordinate with their table and team mascot — orange tigers, red puppies and green geckos. She said it’s important to establish definitive parameters at the beginning of the year and not to change them. Having such “stops” in place allows her to give the students more leeway later on in the school year. My family emitted a collective sigh of relief when we found a school that was a perfect fit for our kids and their persistent levels of activity. With a little effort, I believe other families can do the same; it’s clear that teachers in all kinds of situations can push the limits of traditional physical restrictions in schools. In my own curriculum, as a professor, I have built more and more movement into our classroom activities, forsaking the traditional format of lecturing to her students. It’s often an uphill battle for students who expect a “sage on the stage,” but the benefits have been rewarding. I see fewer students drag themselves to my classes with dread, falling asleep at their desks or noodling around on their cell phones and more students are meaningfully engaged with the content. For parents like me, who see their children struggling to maintain the still, quiet expectation in school, I encourage seeking out educators and schools that allow opportunities for children to learn through their bodies. It is not always easy, but it can be done. Lou Habash is a philosophy professor in New York. Log on to this Facebook page for more updates. This entry was posted in Uncategorized and tagged Philosophy, students. Bookmark the permalink.